Chapter 1. Introduction. 2. Structures. 3. General Polysaccharide Methods. 4. Properties. 5. Synthesis of New Carbohydrate Polymers, Polysaccharide Analogues and Conjugates. 6. Substitution Patterns of Polysaccharide Derivatives. 7. Chemical Modifications. 8. Enzymatic Modifications. 9. Alterations of Polysaccharide Integrity and Electrochemical Modifications. 10. Structure/Property Relationships. References. Subject Index. This book provides the most up-to-date and comprehensive coverage of the structures and properties of polysaccharides, methods for their characterization, de novo synthesis, and modification, as well as advances in structure/function correlations. Many of these topics are summarized for the first time. A brief survey of polysaccharide structures is given highlighting the most significant advances in analytical and spectroscopic technology (NMR, MS, etc.). A chapter is devoted to glycan properties, including conformational aspects, rheological and compatibility characteristics, etc. There is a comprehensive overview of the de novo synthesis of carbohydrate polymers, the transformation of glycans into novel types of polymers, and the preparation of linear and branched polysaccharide analogues and conjugates with synthetic polymers via chemical and enzymatic approaches. The book also details the factors controlling the uniformity of substitutions in homogeneous and heterogeneous derivatization processes and the elucidation of the substitution patterns of partially modified polysaccharides, through combined spectroscopic and statistical methods. One of the important developments in the glycan field is based on the increasing demand for greater control of the functional properties of these biopolymers. The book provides a very extensive account of various types of modifications, including selective and non-selective chemical techniques, biological methods that facilitate alterations or specific functional groups and properties through the application of synthetic or degradative enzymes, and mutational or recombinant DNA techniques. The coverage extends to the control of glycan integrity and molecular weight through chemical enzymatic, physical or other methods. Electrochemical modification techniques are also discussed. 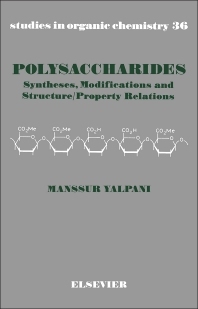 A particularly up-to-date and comprehensive review is given of polysaccharide structure/property relations. Here, the effects of primary structural parameters (composition, molecular size, branching, polyelectrolyte character and non-carbohydrate substituents) are discussed, as are factors which affect glycan solubility, viscosity and gel-forming capacity. Also included are the phenomena resulting from the interactions of polysaccharides with solvents, salts, polyols, surfactants, synthetic and biological polymers. The impact of glycan structural parameters on various biological activities, such as immunological, anticoagulant, and antitumour properties, is surveyed. The book features a foreword by Dr. R.H. Marchessault, and contains almost 2,000 references to the state-of-the-art in the field, as well as an extensive subject index, over 40 tables, and 130 schemes and illustrations. It provides a wealth of valuable information for specialists in polysaccharides, biochemists, biotechnologists, enzymologists, microbiologists, organic chemists, polymer scientists, and others whose work involves these biopolymers.